“The development of a national seismic network will herald a new era in vigilance to earthquakes, tsunamis, and volcanic eruptions in the Solomon Islands, and reduce reliance on overseas agencies for hazard monitoring,” said project leader Dr Craig Miller of GNS Science. The World Bank-funded project involves installing new permanent seismic monitoring equipment in six of the nine provinces, helping to set up a monitoring centre in the capital Honiara, and providing training on maintaining and operating the new gear. GNS Science will also work with local officials to develop interagency operating procedures and procedures for best practise operation of a geohazards observatory. It will also provide expert guidance to enable the Solomon Islands to build and operate its own earthquake monitoring stations. This GNS Science work is part of a wider World Bank-funded project to increase the capacity of the Solomon Islands to manage natural hazards. “As well as improving the monitoring of local earthquakes and assessment of their impacts, the new network will also enhance volcano and tsunami monitoring. It will also enable the Solomon Islands to both contribute to and receive seismic data from other countries in the Southwest Pacific,” Dr Miller said. The seismic monitoring equipment was designed and assembled at GNS Science’s Wairakei facility and air freighted to the Solomon Islands. Over the past 30 years the Solomon Islands, made up of six major islands and several hundred smaller islands, have experienced several disasters triggered by natural hazards, resulting in loss of life and severe economic impacts. In recent years, GNS Science has assisted Vanuatu, Samoa, and Tonga in building their capacity to monitor and mitigate geological hazards. 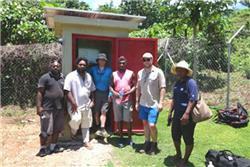 Specialists from GNS Science installed new seismic monitoring stations in the Solomon Islands. Pictured at the solar-powered installation on Makira Island (from left) Kevin Porahora, Jack Gwali (Solomon Islands Government seismology team), Craig Miller (GNS Science), Solomon Possy (SIG seismology team), Cameron Asher (GNS Science), Sally Pita (World Bank). The satellite dish is out of picture.